If you see a blue window “Your file have been ENCRYPTED!! !” on your Desktop, there is basically no doubt that a ransomware infection CryForMe Ransomware has slithered onto the computer successfully. It not only displays a window with a ransom note to users. It also encrypts all files it finds on the computer, including pictures, documents, and media files. 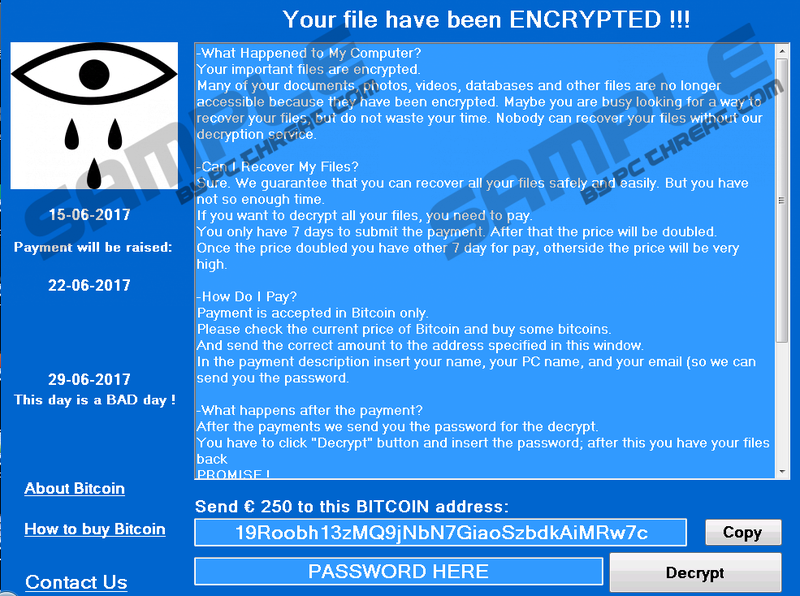 Then, it demands money, so specialists are sure that it is one of these ransomware infections which want to obtain money from users. Do not send the developer of this ransomware-type infection a cent even though you are told that it is the only way to recover files because, unfortunately, there are no guarantees that files will be unlocked automatically for you after you send the money required to the provided Bitcoin address. Because of this, specialists at pcthreat.com suggest going for the full CryForMe Ransomware removal. Although it is not one of those threats which make modifications in the system registry, drop instructions, or create executables, we still cannot promise that it will be easy to delete this ransomware infection from the system. As for the files encrypted by CryForMe Ransomware, it might be impossible to unlock them without the special key cyber criminals claim to have either. It does not mean that a single alternative data recovery method does not exist – find more about that further in this article. CryForMe Ransomware illegally enters computers, but it does not work in the background. That is, it does not try to stay unnoticed. After the successful infiltration, it finds the location of valuable users’ files and then locks those files so that it could demand a ransom. It is not a secret which files have been locked on your computer. Those locked ones can no longer be accessed and, on top of that, they all have a new extension. CryForMe Ransomware might add one of two extensions: .locker or .cryforme. If your files have any of these filename extensions, there is no doubt that they have already been encrypted by this ransomware infection. If you read the ransom note opened on your Desktop, you will find out that you could decrypt your files only by sending a ransom of €250 to cyber criminals within 7 days. If after 7 days cyber criminals do not receive money from you, the price will double, so if you have decided to pay money to them, do this as soon as possible. Unfortunately, we cannot say that it is a smart thing to do. We cannot promise that you could unlock your files for free if you are not going to make a payment to cyber crooks behind the ransomware infection, but there is still one thing you can do to get your files back for free – restore them from a backup. Alternatively, wait for specialists to develop a tool for unlocking data for free one day. After carrying out thorough research about CryForMe Ransomware, specialists working at pcthreat.com are sure that this infection enters users’ computers illegally. Theoretically, users can get it from untrustworthy pages too, but there is no doubt that it usually slithers illegally onto computers when users open attachments from spam emails they receive. In some cases, these emails are not filtered into the Spam folder and appear next to harmless emails, so users open them fearlessly. Of course, there are also users out there who do not know that spam emails might be harmful and, consequently, open emails marked as Spam as well. Stay away from spam emails in the future and install a security application on your PC to ensure your system’s protection. As long as it is enabled on your system, malware could not enter your computer. 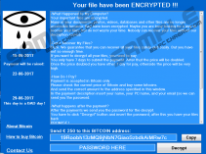 It is impossible to unlock files CryForMe Ransomware has locked by removing this infection from the system, but you still need to do that as soon as possible so that it could not lock your new files ever again. As indicated in the manual removal guide (find it below this article), you first need to kill the process representing this ransomware infection in order to remove the blue window from Desktop. Then, you need to find the launcher of the ransomware infection and erase it. To be frank, it might be located anywhere, so you might find it extremely hard to detect it. If it is the case, use an antimalware scanner. Select Processes when Task Manager opens. Right-click on the process belonging to CryForMe Ransomware and click End Process/End task. Open the Windows Explorer (tap Win+E) and check %USERPROFILE%\Downloads, %USERPROFILE%\Desktop, %APPDATA%, or %TEMP%. Remove all suspicious files you manage to find. Quick & tested solution for CryForMe Ransomware removal.